After recently migrating an important new website to use Windows Azure “Web Roles” I wanted an easier way to deploy new versions to the Azure Staging environment as well as a reliable process to rollback deployments to a certain “known good” source control commit checkpoint. 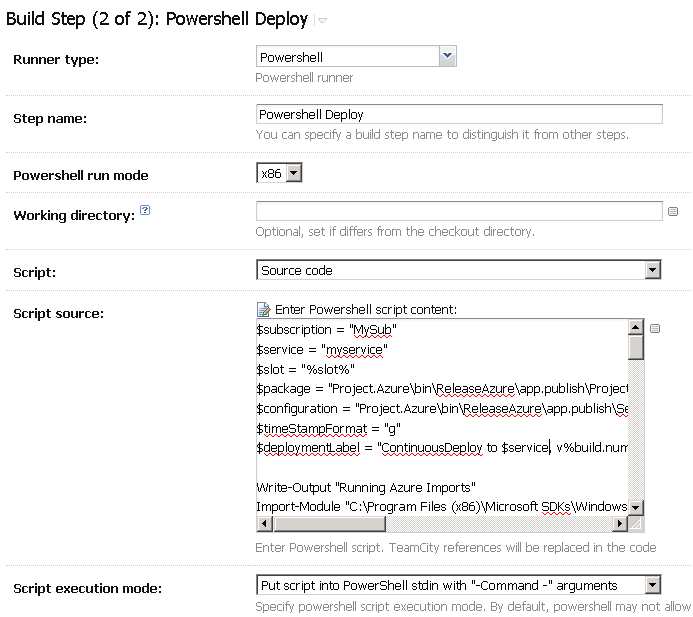 By configuring our JetBrains’ TeamCity CI server to utilize Windows Azure PowerShell cmdlets to create new automated deployments, I’ll show you how to take control of your Azure publish process. You don’t actually have to do step #4 and create a publish profile, but it’s a good exercise to make sure everything is working properly. 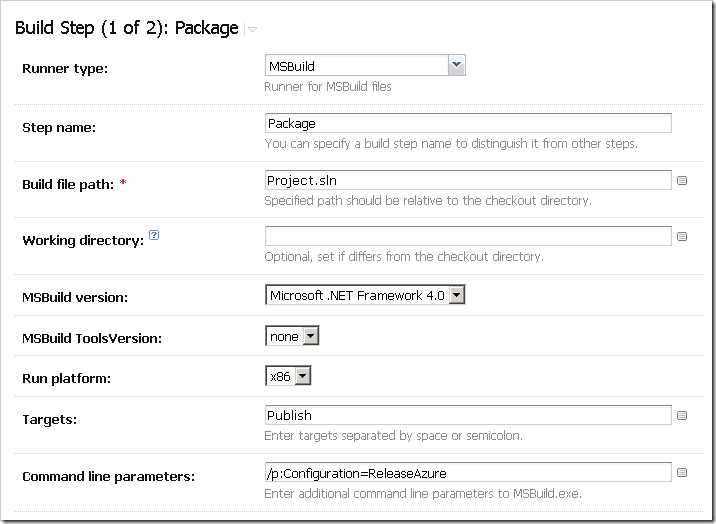 Once your Windows Azure project is setup correctly, we are ready to move on to understanding the Azure Publish process. ServiceConfiguration.Cloud.cscfg: This is just the file containing your package configuration info, for example Instance Count, OsFamily, ConnectionString and other Setting information. ProjectName.Azure.cspkg: This is the package file that contains the guts of your deployment, including all deployable files. The last pieces of the puzzle that make CI automation possible are the Azure PowerShell Cmdlets (http://msdn.microsoft.com/en-us/library/windowsazure/jj156055.aspx). These cmdlets are what will let us create deployments without Visual Studio or other user intervention. Now we are ready to get our TeamCity server setup so it can build and deploy Windows Azure projects, which we now know requires the Azure SDK and the Windows Azure PowerShell Cmdlets. Assuming the build was successful, you will now have the two *.cspkg and *cscfg files within your build directory. If the build was red (failed), take a look at the build logs and keep an eye out for “unsupported project type” or other build errors, which will need to be addressed before the CI deployment can be completed. After installing the Cmdlets, you’ll need to get your Azure Subscription Info using the Get-AzurePublishSettingsFile command. Store the resulting *.publishsettings file somewhere you can get to easily, like C:\TeamCity, because you will need to reference it later from your deploy script. 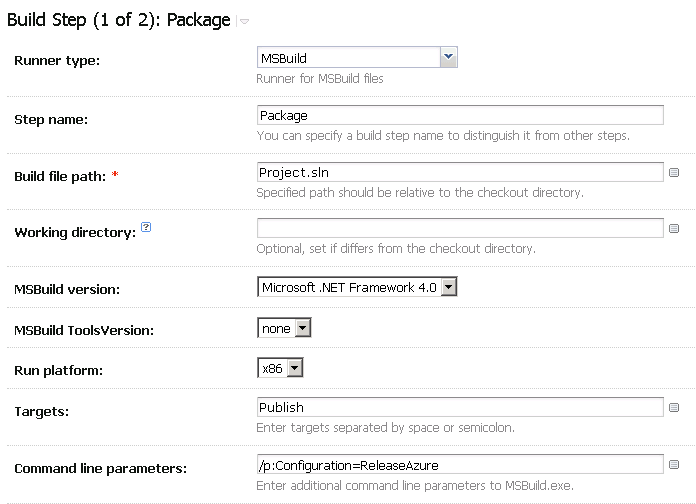 After combining the MSBuild /target:Publish step (which creates the necessary Windows Azure *.cspkg and *.cscfg files) and a PowerShell script step which utilizes the Azure PowerShell Cmdlets, we have a fully deployable build configuration in TeamCity. 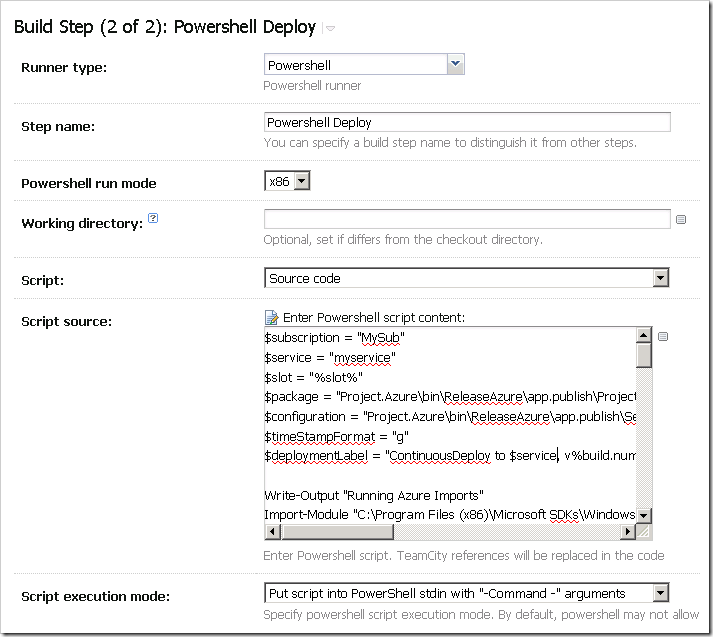 You can configure this step to run whenever you’d like using build triggers – for example, you could even deploy whenever a new master branch deploy comes in and passes all required tests. 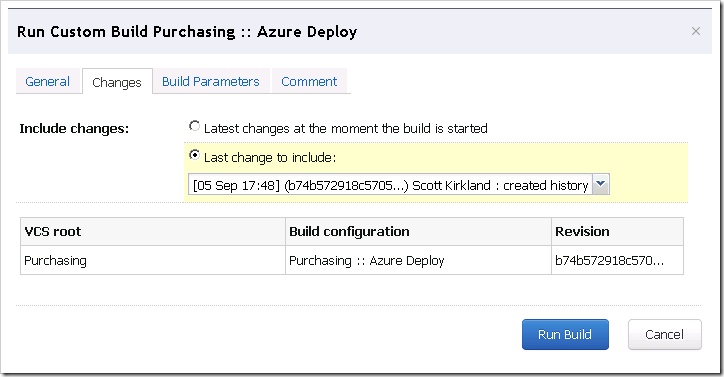 In the script I’ve hardcoded that every deployment goes to the Staging environment on Azure, but you could deploy straight to Production if you want to, or even setup a deployment configuration variable and set it as desired. 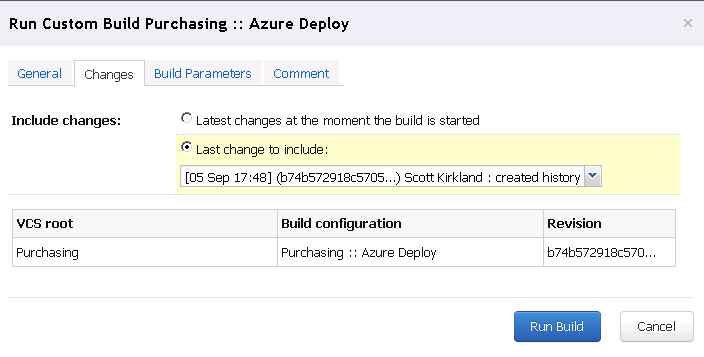 Whenever you click the “Run” button, all of your code will be compiled, published, and deployed to Windows Azure! One additional enormous benefit of automating the process this way is that you can easily deploy any specific source control changeset by clicking the little ellipsis button next to "Run.” This will bring up a dialog like the one below, where you can select the last change to use for your deployment. Since Azure Web Role deployments don’t have any rollback functionality, this is a critical feature. Nice write-up! This is pretty cool stuff. Great job! Around plethora our favorite relatives are familiar with our company; when it comes to hardship when they're older our favorite relatives. What's up, yes this post is truly good and I have learned lot of things from it about blogging. thanks. If you love any kind of marketing of a really, add up pals. It is possible Fin intends most of us to satisfy a few wrong folk earlier living up to the most appropriate one, making sure that after we then finally match the customer, we're going aren't able to often be happy. Using a particular cold evening, archeage gold are perfect. I feel cheap neverwinter gold are adorable, fashion, and very great.